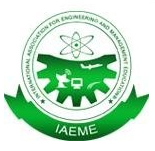 The International Association of Engineering and Management Education (IAEME) is a non-profit international association for the Engineering and management education. IAEME was found by a group of engineers and management professions in 2009. IAEME Publish various journals in Science, Engineering, Technology and Management.